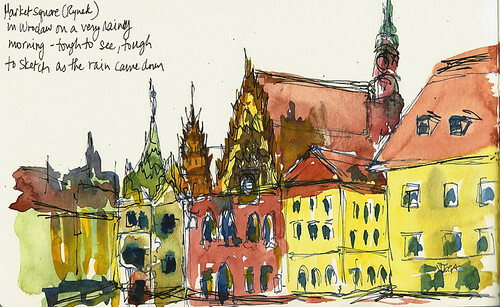 I flew in on a Monday, flew out on a Wednesday -- but what I saw of Wroclaw, Poland, was postcard-lovely. Much of it is relatively recent reconstruction, given that the city lay in ruins after WWII. I went to the Philharmonia one evening to see Mario Hossen and Les Orpheistes Festival Orchestra of Vienna play Vivaldi. 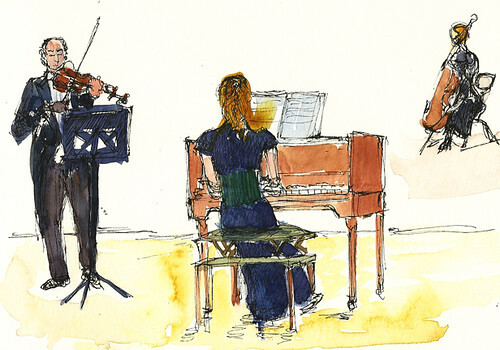 The concert hall itself was nothing to look at, but there was no need for anything to distract the eyes given what was coming out of the musicians' instruments. Daylight hours found me at the office, but a colleague kindly took me on a nighttime ramble around the Old Town, university and Ostrow Tumski. My last day there, I took an early morning walk around the Rynek (market square) in a chilly, driving rain. I huddled beneath a doorway, trying to keep my sketchbook as dry as I could. Wroclaw has gnomes and vintage neon signs and a cathedral and trams (I do love trams) and lots and lots of bridges. All of which (and the pierogi!) will certainly bring me back again.